A Supreme Court verdict has on Wednesday paved the way for regional rural bank (RRB) employees draw pension at par with Nationalised Banks, ending a two-decade long legal battle. The Supreme Court has dismissed a special leave petition filed by the government in 2012 and directed the government to implement a pension scheme in all RRBs uniformly as available in Nationalized Banks as per the bipartite settlement in 1993. About 27,000 retired RRB employees are set to gain from this verdict, which the bank association torch bearers dubbed as historic. RRB’ current cumulative manpower is 95000. The country has 56 RRBs delivering loans primarily to small and marginal farmers and creating financial access in rural belt. 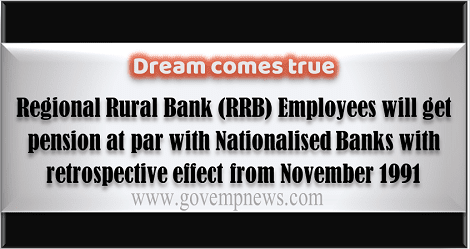 “A dream comes true, the battle for justice triumphs and the long cherished desire of entire RRB fraternity realised,” All India Regional Rural Bank Employee Association said in a note to its members. The employees will be eligible for pension with retrospective effect from November 1991. The verdict was in line with the direction given by the Karnataka High Court in 2011, AIRRBEA general secretary Abdul Sayeed Khan told ET. RRB employees enjoy parity of wages with Nationalised Banks Employees following an award by the Justice S Obul Reddy Tribunal in 1990, which came into effect retrospectively from 1987. But when the employees of the nationalised banks were granted pension, the staff of the RRBs did not get it despite vociferous demands. The rate of basic pension will be 50 percent of the average pay as defined in pension scheme for full time employees. The united forum of regional rural bank employees, which observed three day strike in the last week of March, was also demanding parity of service regulation and allowances at par with their sponsor banks. “We are planning to postpone further agitation for the time being,” said the AIRRBEA note jointly signed by president C Rajeevan and secretary general S Venkateswar Reddy.